Roechelle shares the story of being a little girl and going with her mother and sister to the salon and having her hair chemically relaxed for the first time. Then she explains why she decided to stop doing that and how she embraced her beautiful, natural hair at age thirty-one. 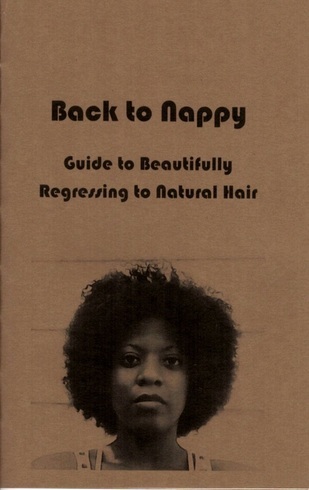 This issue also contains info on transitioning back to natural hair, learning to love the kinks, things to avoid, caring for your natural hair, the types of food to eat to promote healthy hair, her shampoo routine, and how to stimulate your scalp. There are natural food recipes for a pre-shampoo deep conditioner, conditioning henna hair dye, moisturizing shampoo, hair growth scalp oil treatment, shampoo bar and body soap, anti-frizz hair gel, PLUS hair training techniques. Little did we know, we had traded in our beautiful, healthy, natural hair for an evil illusion. This mini zine contains low budget and easy cocktail recipes! No garnishes, mixing sets or fancy glasses needed. I love the tiny drawings that go with each of the tutorials. You'll find a simple mixer recipe, 2 drink making techniques, plus 6 different drink recipes. I've been interested in geocaching for awhile now. Yeah, I am usually late to the party, but there is no better time than NOW to learn this stuff. Heather has compiled everything you need to know about geocaching and included some smart tips to keep you and others safe and having fun. I also appreciate the photos she added to help people like me who are visual learners. Geocaching can take you to some really neat places, maybe some you never even knew existed! - Create the most low maintenance budget ever! A reference guide for Spanish grammar. Is "bien" your only answer to"como estas?" Can you ask where the library is but don't understand the directions?Hoja de Trampas is here to help. This guide is a cheat sheet to intermediate level Spanish grammar and vocab, laying out clear terms how to answer questions, construct complex sentences, and of course, ask where the bathroom is. For Your Health by Anna Jo Beck is a how-to zine on health insurance. It covers how the American health care system works, how to pick a health insurance plan, her opinion on the entire healthcare economy in the United States, and several moments of cute, heartwarming distraction to keep you from wanting to totally give up hope. - Do I need health insurance? - The cost of not having health insurance. - Types of health insurance. - Making the final choice. - Questions to arm yourself with. - How much we spend. - A brief history lesson. - Customer satisfaction not guaranteed. - Final thoughts & resources. Issue 9 will teach you about how the different levels of government represent you, and help provide a foundation to being civically engaged. From Federal, to state, on down to county and local branches, Biff Boff Bam Sock provides who they are, what they do, and how they’re elected. Also includes some starting points for registering to vote, contacting your reps, your own beliefs, and steps beyond just voting! Sage writes,"The following pages depict my findings of what makes a solid community, the interpersonal dynamics of communication, and how to build your own community from the ground-up." Community How To covers so much necessary info, such as community membership, integration and fulfillment of needs, shared emotional connection, communication, forming a community, developing new cooperatives (business planning, obtaining tax exempt status, purchase/lease building) and community balance and structure. A radical resource for those who are ready to take the next step in setting up an intentional community. 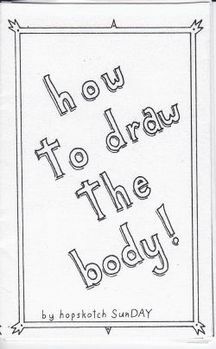 HOW TO DRAW THE BODY! Whether you are new to drawing or just interested in learning some extra tips on drawing the human figure, this mini zine is for you! It's perfect for all ages. hopskotch gives us a step-by-step tutorial with visuals on how to easily create bodies in various poses. Beginners have no fear - you will be drawing rad humans in no time. 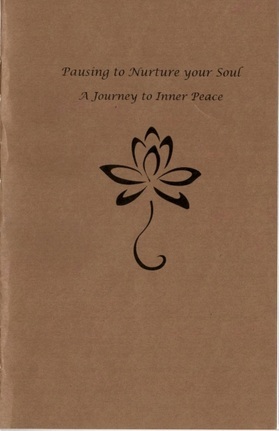 Roechelle has some excellent ideas on how to reach inner peace. There are tutorials for meditations, keeping a grateful journal, various affirmations, and ways to exude inner peace. She explains what Zen-full means and includes six ways to be more Zen-full. I enjoyed her list of foods that promote tranquility and the variety of mandala outlines that are ready to be colored in! I love the vibe of this zine! Why? Because Roechelle has collected multiple awesome ways to respect this beautiful planet we live on and bettering ourselves at the same time. Without the earth there can be no us, so let's just stop the madness, band together and hug these trees until being Green is the only way to be. Thought provoking and zen-inspired quotes to meditate on through thirty games of sudoku! Sudoku is a puzzle game designed for a single player, much like a crossword puzzle. Learn more here. Sage writes, "This is a book about following your breath and living mindfully in the present moment; this is a book about zen with quotes from many wise people; this book also has sudoku. ... While playing through these pages, try your est to stay fully present with the words, the numbers, and solving the sudoku!"